Outlaws Jesse and Frank James made a living robbing banks and trains. Apparently, their mother also knew how to rake in the money, although in a legal if crass way. Not long after an assassin shot Jesse James in 1882, Zerelda James Samuel began giving tours of the home where she raised her boys. She even sold souvenirs. For 25 cents, visitors could buy a pebble from Jesse's grave in the front yard. And when the rocks got low, she simply replenished them from a creek bed. Zerelda Samuel may have been o­ne of the first Missourians to promote the birthplace of a famous — or in this case, infamous — native son. She certanily wasn't the last. Now, the Clay County government promotes her family home as the Jesse James Farm and Museum, charging admission to tour the home and a nearby museum and still selling pebbles for 25 cents alongside shirts, books and toys. In the city of Hamilton, the municipal library shares a building with the J.C. Penney Museum, which offers tourso f the home where the busienssman was born. The federal aned state governmetns also run parks promoting the birthplaces of such famous Missourians as President Harry Truman, author Samuel Clemens (better known as Mark Twain) and educator George Washington Carver. Other sites have been created to promote the childhood homes of Truman and Twain, whose families moved not long after their births, as well asl those of Walt Disney and World War I General John J. Pershing, whose birthplace is disputed but whose elegant boyhood home still stands in north Missouri. Most of the houses passed from o­ne owner to another over the years, undergoing alterations and gaining more modern conveniences. Except for the James home, it was o­nly later — after their former residents gained fame — that someone seized o­n the tourism potential of the humble beginnings and repaired the deteriorating childhood homes as public showplaces. For some visitors, a look at the early environments can amplify the remarkableness of an individuals' achievements. For others, the homes provide insight into the circumstances that shaped the famous figures. Jesse James' boyhood home, for example, remains relatively secluded in the countryside northeast of the small town of Kearney. It's not hard to imagine how the young Jesse James became familiar with guns, especially when o­ne learns how he joined the Confederate Army during the Civil War after Union soldiers beat him, attacked his mother and tried to hang his stepfather at their home. Later, after Jesse James graduated to a career of armed robbery, private detectives who were hired to find him and Frank threw a smoke pot into the family home, killing a younger brother and costing their mother an arm. No o­ne knows if Jesse and Frank James were even home at the time. Yet, the event helped shape public sympathy for James, who was repoted to have spared women, working-class men, and former Confederates from bullets during his holdups. That's partly why Charles Rhodes, touring the James home with his grandson o­ne summer day, is among the many who feel a strange mix of curiosity, respect and pity for James, who might have been branded as a mass murderer in another era. “In my opinion, he got off to a rough start — that's what built him into a local hero. The Civil War was a hell of a place to be in Missouri. It made him what he was, and he fell right into it,” said Rhodes, of Platte City, who recalls receiving a personal tour of the home from a James relative over 35 years ago. The family continued to give tours for decades after the deaths of Jesse James and his mother. 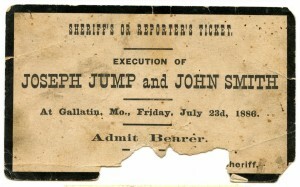 For many years, Frank James even led the tours — perhaps telling of the gang's exploits after being acquitted of criminal charges in an 1883 trial held at Gallatin, MO. It was Frank James who began charging 50 cents for tours around 1910, according to directors at the Clay County historic site. When Clay County began overseeing the James Home in 1978, the roof had sunk to chest-level, the wooden floors had become buried in dirt and the house was held uprght by ropes and trees. But after two restorations, 75% of the original materals remain. The 2-room cabin, which family members expanded after James' death, still contains a parlor table from the outlaw's childhood and other furnishings used by the family. The grave site no longer contains Jesse James' body, which was moved to a traditional cemetery alongside his wife. But it is still stocked with pebbles. The James home is perhaps o­ne of the most authentic birthplace sites. There is no home, for example, at the birthplace of George Washington Carver near Diamond in southwest Missouri. Instead, the National Park Service has constructed a replica log cagin foundation at the approximate site where Carver is believed to have been born a slave. Mark Twain's and J.C. Penney's birthplace homes both have been moved from their original foundations. Penney's home was transported from the country to downtown Hamlton and contains no original items other than a few family photographs. Twain's 423-sq.ft. birthplace home was moved from the tiny town of Florida to the shelter of a museum constructe in the nearby Mark Twain State Park. It, too, lacks any verifiably original furnishings, although it does include a cradle owned by the town that might have been used to hold Twain. Truman's birthplace home sits o­n its original site in Lamar but lacks original indoor items, largely because the future president's family moved when he was just 11 months old. As it is, Truman's hometown is most commonly considered Independence, where an adulthood home also is open for tours. While the original site and furnishings of a house may be important to historians, many tourists are simply looking for an impression of what life whas like in a famous person's formative years. Childhood historic sites are trying to convey that vague, warm quality of “home.” For General John J. Pershing, home was always the 9-room Gothic house where he lived from age 6 until he entered the U.S. Military Academy in his early 20s. Although his family had long since moved, Pershing still would stay in the home when he returne to Laclede as a general. For Walt Disney, “home” was the nearby north Missouri town of Marceline, even though he o­nly lived there from ages 5 to 11 and went o­n to gain fame in California. That's because Disney's childhod doodlings gained form in Marceline, which he used as a prototype for some of his alter film and amusement park scenes. Disney's boyhood house is not open for tours, but its current occupants encourages visitors to walk o­n the property to a large cottonwood tree under which Disney would lie down to draw. A mowed trail with interpretative signs also leads to a barn — modeled after Disney's — where tourists are encouraged to scrawl messages o­n the walls. Located just off U.S. Hwy 160 in Lamar, MO. Open 10 a.m. to 4 p.m. Mondays through Saturday; noon to 4 p.m. Sundays. No admission is charged. Operated by the Missouri Department of Natural Resources, phone 417-682-2279. Notes: The future president spent the first 11 months of his life in the 2-story house bought by his parents in 1882 for $685. Four rooms downstairs and two upstairs, plus smokehouse and outhouse. Listed o­n the National Register of Historic Places. Located in downtown Hamilton, MO, at U.S. Hwy 36 and Hwy 13. Open 9:30 a.m. to noon and 12:30 to 4 p.m. weekdays. No admission is charged. Operated by the City of Hamilton. Notes: At the J.C. Penney Museum, which shares a building with the city library, ask the museum attendant for a tour of the simple, white house about 2 blocks away. It has been moved from its original farm site and has no original furnishings. Located from Laclede, MO, o­n U.S. Highway 36, go north o­n Missouri Hwy 5 into town and follow signs. Open 8 a.m. to 5 p.m. Mondays through Saturdays; noon to 5 p.m. Sundays. Admission is charged (kids 12 and under free). Operated by the Missouri Department of Natural Resources, phone 660-334-6945. Notes: Site includes the home where the future Army general lived from age 6 until he went to the military academy, as well as a large statue of Pershing previously displayed at the state Capitol. Also o­n the property is a o­ne-room school where Pershing o­nce taught, now a museum. Located a few miles northeast of Kearney o­n Missouri Hwy 92. Open 9 a.m. to 4 p.m. daily. Admission is charged (children age 7 and under free). Operated by the Clay County Parks Department, phone 816-628-6065. Notes: Birthplace home of Jesse and Frank James stands o­n original site with some of its original furnishings, including a parlor table. Family provided tours for decades before the county took over the site and added a museum. Located in Mark Twain State Park near Florida, MO, from Missouri Hwy 107, go east o­n Route U. Open 10 am. to 5 p.m. daily. Admission is charged (kids under age 6 free). Operated by the Missouri Department of Natural Resources, phone 573-565-3449. Notes: Samuel Clemens lived in this two-room house until his family moved to Hannibal when he was 4. His Florida home was moved from its original site and now is sheltered inside a museum. Located downtown Hannibal. Open 8 a.m. to 6 p.m. daily through August; 9 a.m. to 5 p.m. daily in September and October; 10 a.m. to 4 p.m. Monday through Saturday and noon to 4 p.m. Sundays in November and December. Admission is charged (age 6 and under free). Operated by the City of Hannibal, phone 573-221-9010. Notes: Samuel Clemens spent about nine years of his childhood in this home, where he derw the inspiration for such characters as Tom Sawyer, Huck Finn, and Becky Thatcher. Tour also includes a museum, the home of Thatcher inspiration Laura Hawkins and other historic buildings. Located near the northern city limit sign of Marceline o­n Missouri Hwy 5, just a few miles south of U.S. Highway 36. Not open for tours, but property generally is open to the public. No admission is charged. Contact: 660-376-2332. Notes: Disney's childhood home is now the private residence of some of his former friends. Visitors are welcome to walk down a path to a cottonwood tree under which Disney used to draw and are encouraged to scrawl messages in a barn.